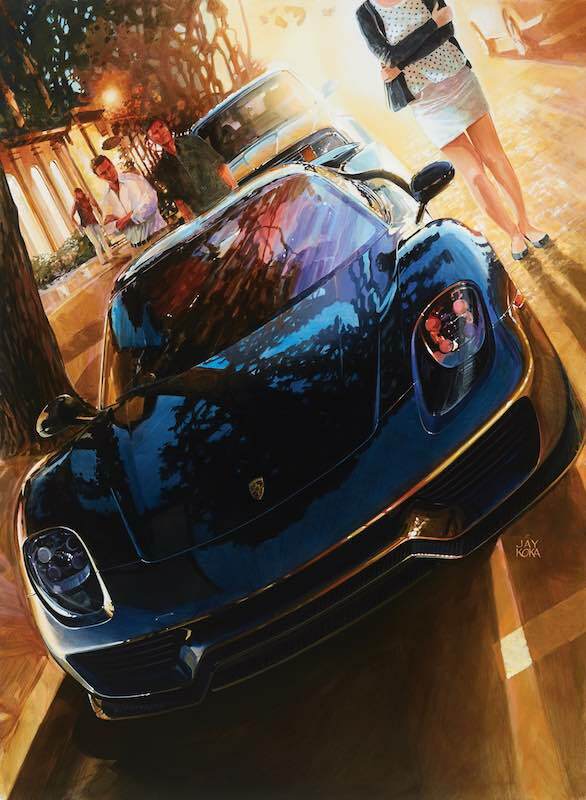 The Automotive Fine Arts Society (AFAS) will return to the Pebble Beach Concours d’Elegance with a selection of automotive artwork on Sunday, August 21, 2016. Sponsored by the Lincoln Motor Company, this year’s Pebble Beach exhibit will showcase the latest creations from automotive artists around the world. Additional AFAS guests attending the 2016 Pebble Beach Concours include artists Sandrine Blondel and Dan McCrary, Robert E. Larivee — Author of “Hot Red Detroit” and the Art Center College of Design. Along with the exhibit on Sunday, AFAS will also host an invitation-only reception sponsored by the Lincoln Motor Company on Saturday, August 20. This event has become a popular destination for celebrities and industry leaders to preview the latest AFAS pieces. Created in 1983 by six artists the society made its first appearance as a group at the 1986 Pebble Beach Concours d’ Elegance. Still very much involved with the event, AFAS is comprised of more than 25 members who demonstrate talent, innovation and a passion for automobiles.